Available in sizes from 16mm x 38" to 63mm x 2"
These dp pvcc union fittings are used to join to a piece of Corzan CPVC pipe to provide a threaded brass female connection. 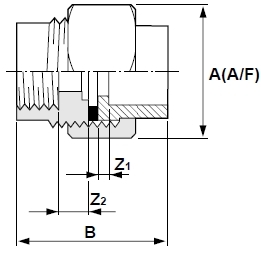 The threaded female end will connect to a standard bsp threaded fitting. DP PVCc Union Plain / Brass Female BSP Thread 16mm x 3/8"
DP PVCc Union Plain / Brass Female BSP Thread 20mm x 1/2"
DP PVCc Union Plain / Brass Female BSP Thread 25mm x 3/4"
DP PVCc Union Plain / Brass Female BSP Thread 32mm x 1"
DP PVCc Union Plain / Brass Female BSP Thread 40mm x 1 1/4"
DP PVCc Union Plain / Brass Female BSP Thread 50mm x 1 1/2"
DP PVCc Union Plain / Brass Female BSP Thread 63mm x 2"